One of the two spies who reported positively about the Land of Israel. Caleb son of Jephunneh, of the tribe of Judah, was one of the twelve men sent by Moses to spy the land of Canaan and report back about its cities and its inhabitants; to find out if they were strong or weak, few or many; and to bring back the fruit of the land. The spies went and scouted the land–from the wilderness of Zin to Rehob, near the entrance to Hamath. 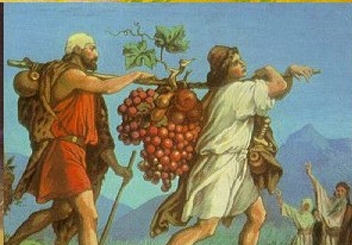 Forty days later they returned to the camp carrying pomegranates, figs, and a branch that had a bunch of grapes on it so heavy that it took two men to carry it on a pole between them. Their report turned out to be disheartening and defeatist. The Israelites refused to listen to the encouraging words of Joshua and Caleb. They started to wail and cry. God punished their cowardice by condemning them to wander 40 years in the wilderness–one year for each day that the spies scouted the land–and to die in the desert. Caleb and Joshua were rewarded for their bravery by being allowed by God to come into the Promised Land and possess it. Caleb had three sons: Iru, Elah, and Naam. He gave his daughter Ahsah in marriage to her cousin Othniel son of Kenaz–Caleb’s younger brother–as a reward to Othniel for having taken Kiriathsepher during the conquest of Canaan. Ahsah convinced her father to give her springs of water, complaining that he had given her away as “dry land”–that is, without dowry (Joshua 15:19). The commandment of tzitzit (fringes) reminds us to enhance our vision with faith and see new possibilities.